Safelincs, the UK’s leading online fire safety suppliers, are extremely happy to unveil a new addition to their customer services staff. 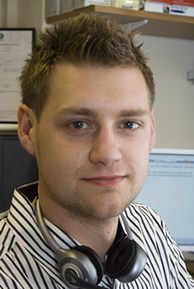 Daniel Vines is a Journalism graduate from the University of Lincoln. Since leaving University, Daniel joined a family run business specialising in producing equine housing, taking the role of customer services and sales. Three years ago, Daniel joined his local Fire station as a retained Firefighter, where he has developed his fire safety knowledge. The transition into this new role at Safelincs is therefore a natural progression. Daniel will also be focusing on marketing, helping Safelincs to move forward, despite the current financial crisis. Safelincs are continuing to employ new members of staff, recently employing a warehouse manager and are looking to employ an international business developer and a web developer. Harry Dewick-Eisele, MD of Safelincs said: “We are putting more resources into reaching out to our customers, making sure they have the best possible service”.